Gary Clarke's COAL, the Yorkshire choreographer's response to his upbringing in the working-class mining village of Grimethorpe, is an exceptionally tough but deeply rewarding watch that binds musical, dancing and acting qualities for a larger-than-life, thoughtful and humane experience. Set at the time of the 1980s miners' strike, in the shadow of an infamous Iron Lady, five professional dancers, a local community cast of four, a pint-sized but gallon-hearted leading woman and five members of the Downshire Brass band take their places in Belfast's MAC to engage us in what makes, breaks and influences the lives of characters in a mining town. In some ways, it's Brassed Off again, but closer to the time and the bone, including attractive music, attractive dancing and an attractively enriching aesthetic but excluding the superficially attractive populist narrative strands that diverge from the painful reality, the story serving the research rather than vice versa. It's a bit like Brassed Off without Gloria and the big competition. 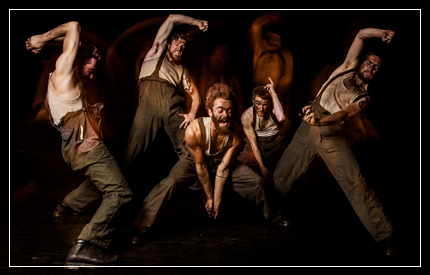 Split into three acts over eighty minutes, COAL takes us inside the family, into the pits and out into the community, entertaining and enriching with its music, movement and dialogue. Early exchanges feature the frankly brilliant TC Howard as a miner's wife going about her daily chores with manic frustration. Clarke's movements and Howard's expressions, given extra depth courtesy of a male dancer, are entirely fitting for someone fed up but resigned to her "duties". It critiques old-fashioned patriarchy and male privilege ("I shouldn't have to dress you – you're a grown man!") as much as it signifies traditional entrenchment. It's frenetic, funny, and like every single element of COAL, both real and a challenge. When the band are not playing familiar works like Morning Has Broken or The Floral Dance (Brassed Off, again) or snippets of lively tuneage and classical music aren’t providing the cast – and us – with requisite forcefulness or excitement, we’re taken "underground" for a full on exposure of the mining process. Aided by strong lighting and sound effects, Clarke and his dancers really get down to business, dedicated to showing the camaraderie and reality of those who define the foundations of their community. The sad aspect of their work is that, however valuable it is, it's out of sight amidst the eighties' me-ness, where they're not considered worthy of attention among "success" in an individualistic, dog-eat-dog world. As intense as this sequence is, however, it threatens to drag. Fortunately, the dark mechanics of COAL are soon traded for some light relief, a "fake" interval with biscuits and a raffle for the audience alongside cheery song and dance. But then Margaret Thatcher herself arrives. Played by Eleanor Perry as a frightening firebrand of a conductor and bullishly voiced by Spitting Image's Steve Nallon, the omission of the word "hope" from her famous election-winning speech is no coincidence – soon the community will feel none of it. This, arguably, leads COAL towards its zenith. As the figurehead of working class women, Howard takes her performance to another level, inspiring the communal cast. And with the arrival of the picket line and the presence of a "scab", the production bravely opens a window into a world one would rather not face. The moment one (literally) crosses the line during the strike, essentially shrugging his shoulders and accepting that "it is what it is", he is surrenders the passion and emotion that defines him. His simple servility earns him no respect from Thatcher and no forgiveness from his community. What may be perceived as pragmatism externally is unavoidable internal pain for people who "may not have much, but (at least) have each other", an affecting hint of class divisions and realities in COAL, and, for that matter, present-day society. COAL was staged at Belfast's MAC Theatre from March 21-22 as part of a UK Tour.